Types of meat include chicken, beef, lamb, pork and bacon. Meat is animal used as food. 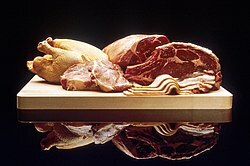 Types of meat include beef and veal from cattle, pork, ham and bacon from pigs, mutton from sheep, venison from deer and poultry from chickens, ducks and turkeys. The word meat is also used for sausages and for non-muscle organs which are used for food, for example liver, brain, and kidneys. Eggs may also be included. In the meat processing industry, (in some countries) the word "meat" is to mean only the flesh of mammalian species such as pigs, cattle, etc. but does not include fish, poultry, and eggs. Pages in category "Meat Recipes"
The following 200 pages are in this category, out of 2,908 total. This page was last edited on 10 May 2012, at 12:12.